Now, this is a treat to see! 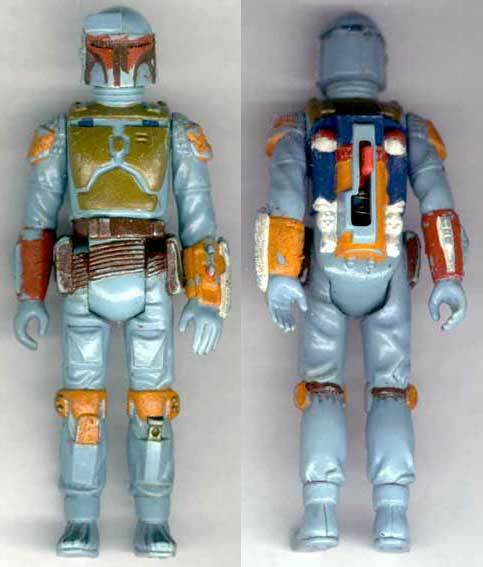 As any Star Wars collector worth his or her salt should immediately realize, it's a rocket firing Boba Fett figure, the most notorious of all toy prototypes. But whereas most RocketFetts are either completely unpainted (as most of the L-Slot variety are) or are painted just like the production figure (as most J-Slots are), this one has been meticulously painted by hand. I don't think I have to point out all the painted details that make this piece unique when compared to the standard figure; most collectors will notice them immediately. I personally think it's cool that the dart-launchers on the wrists and straps connecting the shoulder and chest armor were delineated. It's hard to figure out exactly why this figure was painted in such a manner. In all probability, Kenner never dreamed of giving it such an elaborate paint job once it was put into production-- it would have been too expensive. But it's definitely neat to see. It should be noted that, while the figure is of the L-Slot variety, it is not composed of the bluish plastic that most L-Slots are. Rather, it's grayish, much as the later J-Slots and production figures are.